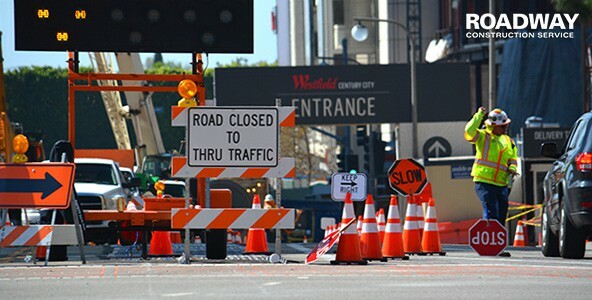 It’s a problem facing municipalities every day – what’s the best way to guide traffic through busy construction zones or other roadway impediments? How can safety and efficiency be maximized with so much going on? Roadway Construction Service (RCS) addresses this need with the industry’s most reliable traffic control solutions. Formulated by experts in every field, our traffic control solutions ensure unsurpassed safety and efficiency for vehicles and pedestrians traveling by work zone environments. The success of our traffic control solutions stems for good, honest teamwork. When our players take the field, it’s with a fierce determination to work together and give it their all. The MVP goes to everyone. Among the deserving recipients are the RCS traffic control flaggers. Trained to the highest safety standards (including OSHA), they work in tight groups, each member tuned to the other. The groups consist of between five and ten knowledgeable experts carefully managed by a traffic control supervisor (TCS). Like a coach, the supervisor must know the team and execute the work zone safety plan based off the traffic control permit. Thus assembled, they become guardians of the work zone. A traffic control supervisor also makes certain that flaggers get their fair share of breaks. The rest periods are well-deserved. Not only do traffic flaggers invest long hours in the process of signaling motorists and pedestrians. They also expend substantial energy on preliminary work. This includes setting up traffic signs well ahead of the flagger-patrolled work zone. Consider these signs a first line of protection, working in tandem with the second line — flaggers. As with many areas of contemporary life, hardware and software play key roles on heavily-traveled roads. Bluetooth and Wi-Fi are some of the contributors. Currently, sensors utilizing Bluetooth and Wi-Fi systems provide critical traffic-monitoring data for road management purposes. Input such as number of vehicles and road speeds can be used to make roadway traffic control adjustments if needed. Long-standing technologies and devices make their own contributions to effective traffic control. Protecting the roads for many years, these have become familiar to motorists and pedestrians. The list includes warning devices such as variable message signs (VMS), high-level warning devices (typically installed on elevated areas such as poles), and channeling devices such as cones, drums, and road delineator domes (plastic poles capped by dome). All of the above-mentioned road traffic control devices have proven reliable over the years. But when it comes to sheer strength, nothing surpasses the king of traffic barriers – k-rail. Also known as Jersey barrier, these wall-like structures are made of concrete or high-strength plastic for ultimate muscle. Effective road traffic control doesn’t just materialize on the spot. It is the result of extensive traffic control planning by a premier team of strategists. Roadway Construction Services invests considerable time an effort in this preliminary phase. We want to know every inch of the territory before deploying our resources. And we make sure that key city officials and business owners are equally up to speed. By sharing our traffic control plan with these participants, we get everyone on board well ahead of time. As a result, authorizations typically are granted with blazing speed, and we’re off protecting work zones with maximum efficiency. Are you looking for proven traffic control solutions? Count on Roadway Construction Service for the best in road traffic control. To learn more, contact Roadway Construction Service for additional information about our industry-leading solutions and competitive rates.